Are you getting enough antioxidant? According to research, we need a minimum of 8,000 (female) – 11,000 (male) antioxidant units a day to avoid the state of oxidative debt (also called oxidative stress), whereby our body doesn’t have enough antioxidants to neutralize the free radicals generated from our physiologic functions e.g. metabolism, external stress, pollution and unhealthy lifestyles. Chronic damages caused by unchecked free radicals are the main cause of ageing and a plethora of degenerative diseases, which have been discussed at length in the other blog post “Free radicals, low antioxidant levels and health“. 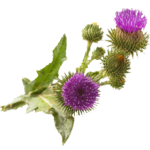 So, how can we reach our daily minimum of 8,000 -11,000 antioxidant units? “I take 5 portions of fruits and vegetables a day, I should have enough antioxidant in my system, no?” Not necessarily. “Even nine servings of fruits and vegetables a day may not reach the minimum recommended intake of antioxidants if one doesn’t make the right choices.” said Dr Michael Greger M.D. FACLM. All fruits and veggies aren’t the same. It is not the quantity but the quality of fruits and veggies that matter. 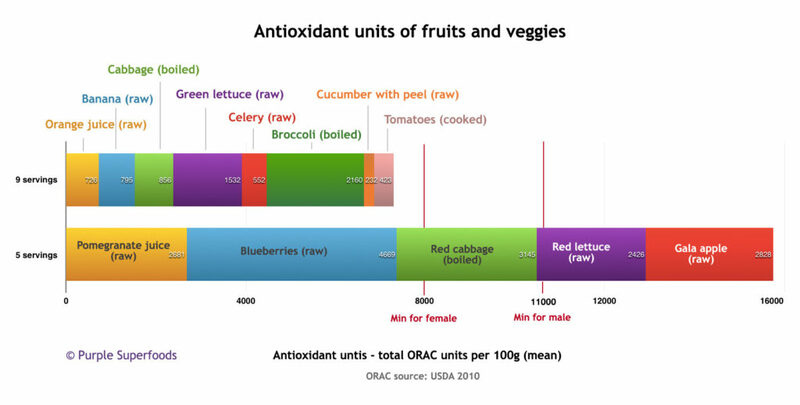 In the 9 servings column, although 9 different types of fruits and veggies in different colours have been consumed, the antioxidant units are not even reaching the minimum 8,000 units that a female requires. 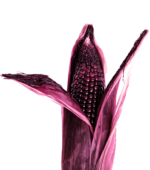 On the other hand, by making good choices of fruits and veggies, leaning towards darker purple/red/blue fruits and veggies that are richer in phytonutrients such as anthocyanins, only 5 servings of these have surpassed the minimum requirements for both females (8,000 units) and males (11,00 units). 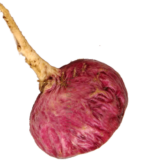 “We should try to go above and beyond the antioxidant food minimum. Ideally, we need to be constantly soaking our bloodstream with antioxidants, meaning that we should consume high-powered fruits and vegetables—like berries, beans, and green tea or hibiscus—all day long,” he advised. Is there a supplement to provide close enough antioxidants?